As the end of 2018 approached last month, I started a different kind of new year’s countdown for two nearby businesses. Throughout last year, I passed the following soon-to-be-restaurants frequently, and each featured signs announcing their imminent arrival. However, rather than a simple “Coming Soon!” sign, both establishments opted for more specificity. 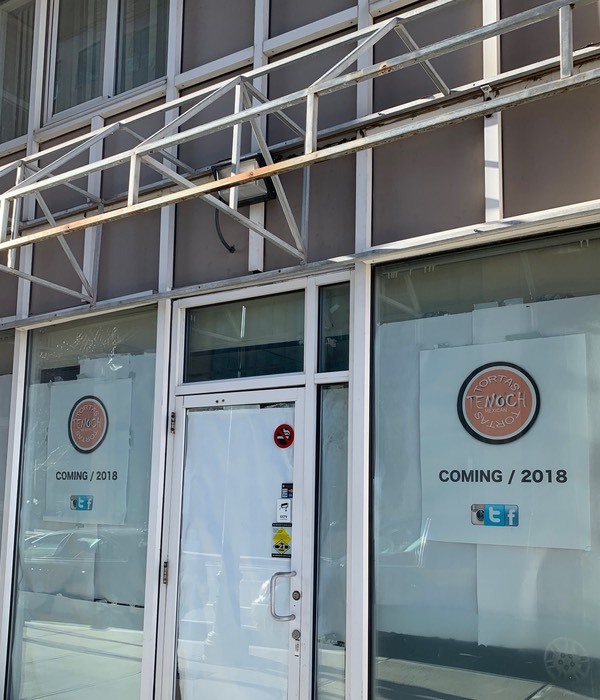 As you can probably guess from the headline of this post, Tenoch didn’t make their opening in 2018. As of yesterday, these signs remained up, and the restaurant did not look particularly close to opening. I’m not sure when those signs first went up, but it was several months ago. 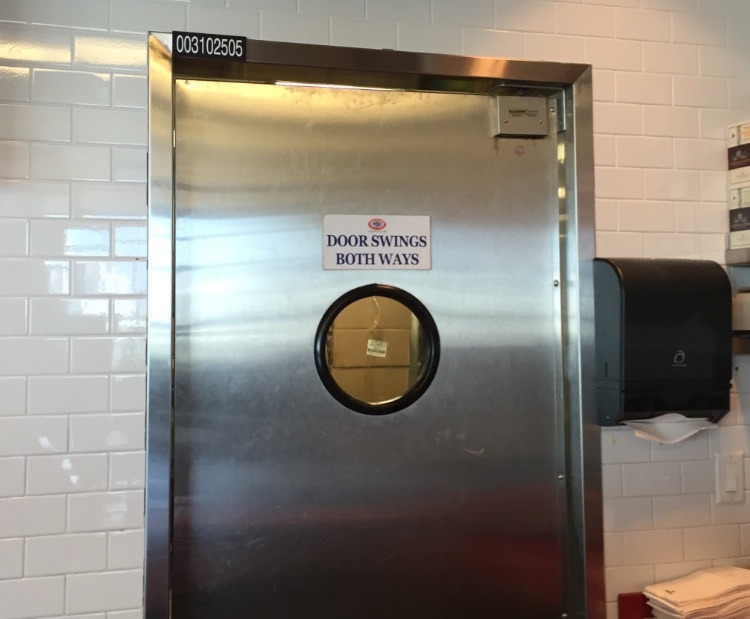 The restaurant had through December 31st to hit their self-imposed goal, but alas, they fell short. I think it’s fair to say that “late fall” means approximately Thanksgiving and onward. At that point, why would they not just give themselves a little more breathing room? Despite what our local weather often seems to indicate, fall in the Northern Hemisphere technically lasts until almost the end of the year. They could have simply said “Late 2018” or even just “2018”. 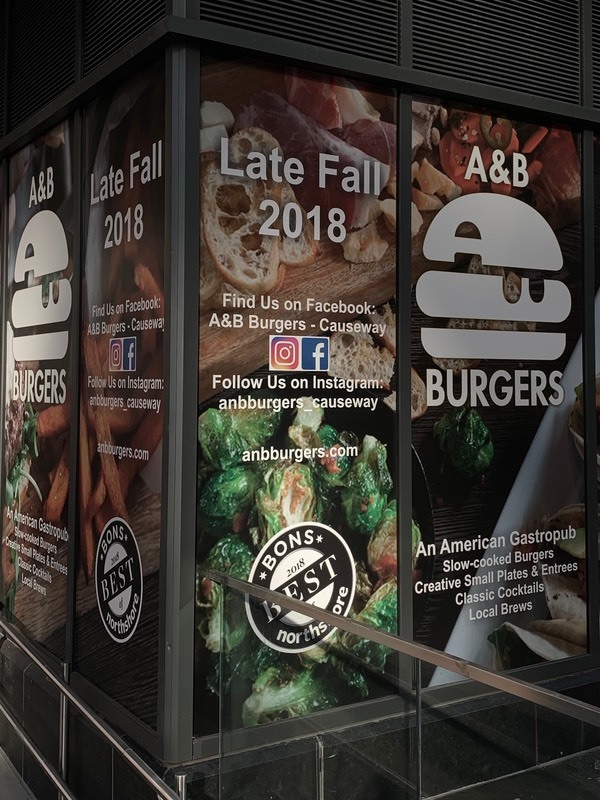 Alas, the folks at A+B Burgers flew too close to the sun on wings of ground beef before coming crashing back to earth on December 21st. Of course, they didn’t make it by the 31st either, so they’d have been screwed either way. Goofy though they are, it’s likely that these businesses will open in the coming weeks, or at least sometime this year. Assuming they do, neither of these businesses will come anywhere close to the all-time reigning champion for inaccurate estimates. 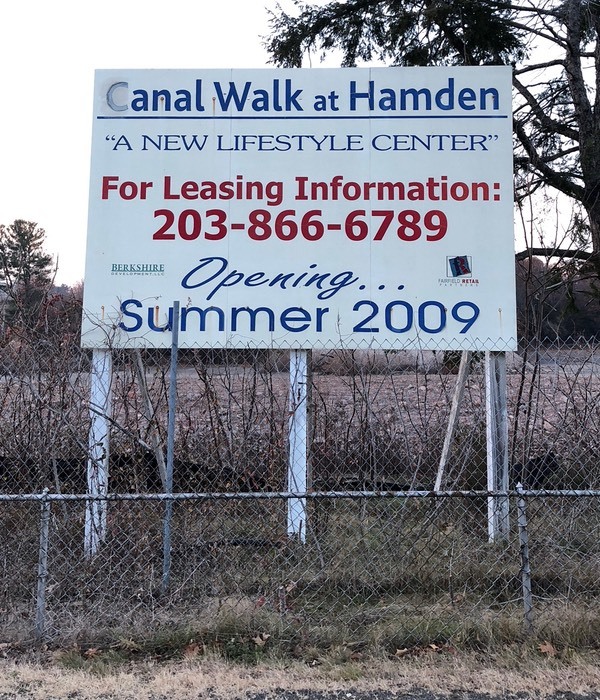 That would be Canal Walk at Hamden, a “new lifestyle center” slated to open in Summer of 2009. This picture was taken with an iPhone X. For nearly a decade, I passed this sign while driving between Boston and New Jersey to see my family. I would look for it about halfway through my trip, and it just got funnier every time I saw it. Now I know, the financial crisis of 2008 almost certainly stalled this development, and perhaps even bankrupted some poor developers. And unlike a restaurant, it makes sense to advertise this before it opens, to get businesses signed on. But wouldn’t you think someone would take this sign down once the date had passed? Perhaps in the fall of 2009, or early 2010, or at least sometime during the Obama presidency? It was visible to tens of thousands of cars passing on the highway every day, but it was also accessible from a walking path. Hell, with can of spray paint, anyone could’ve done them a favor and at least removed the date. And yet, this sign survived, year after ridiculous year. This particular photo was taken in late December of 2017, but my own delays meant I never managed to write about this while the sign was still standing. At some point in 2018, the board was finally, mercifully, removed. The project itself is still nowhere to be seen, of course, but at least that sign is no longer lying to every passerby. At a minimum, this project’s monument to failure stood for eight and a half years past its purported deadline. That’s a record I doubt I’ll ever see broken. I was struck by the non-corporate nature of this sign, and particularly amused by its arts and crafts style. My hunch was that someone had made it with supplies from the store itself. I could easily picture them grabbing a deck of cards2, a few markers, and a piece of poster board, then putting this all together. A close inspection shows the sign even has a border of Christmas lights on it, though they were not illuminated at the time. While the whole thing was probably assembled in a back office, I’d like to imagine its creator sprawled out in the middle of a less-visited aisle, looking exactly like a middle schooler working on a science fair project. 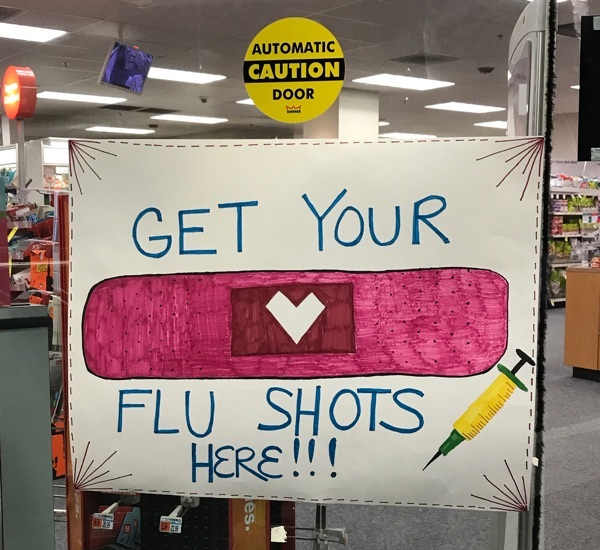 Finding two different handmade signs in two CVS stores multiple miles apart seemed like quite a coincidence. 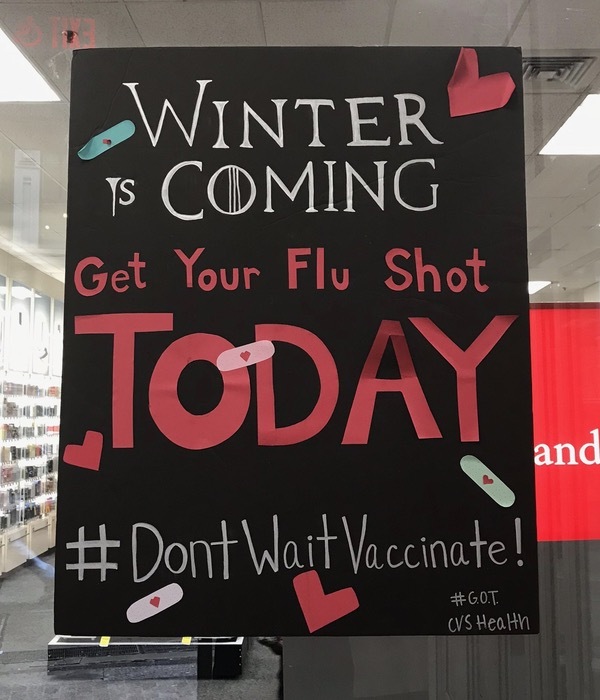 I began to suspect something was up, and immediately headed over to the other CVS near my house (Store #4666) to see if they had a similar sign. However, a quick look around that store turned up nothing. 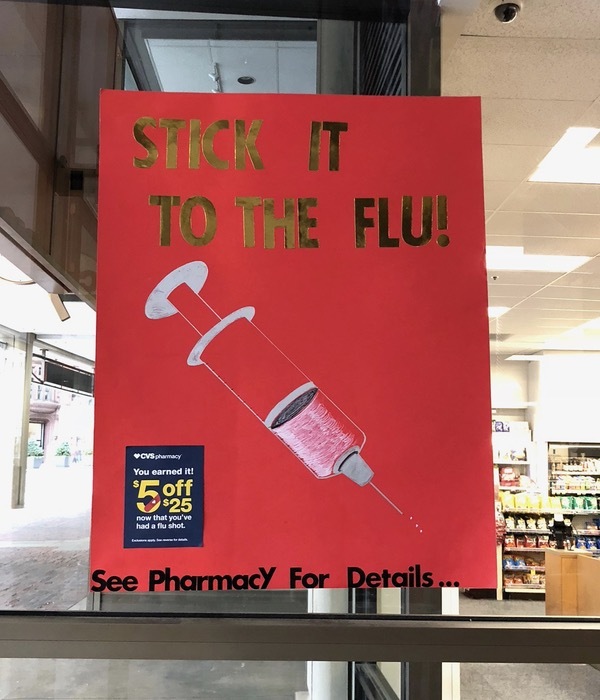 I left thinking that perhaps it was mere chance that the first two stores were advertising flu shots in similar fashion. This sign was bizarrely hung at about hip level, and the legibility was not great, but it did contain an impressive amount of detail. 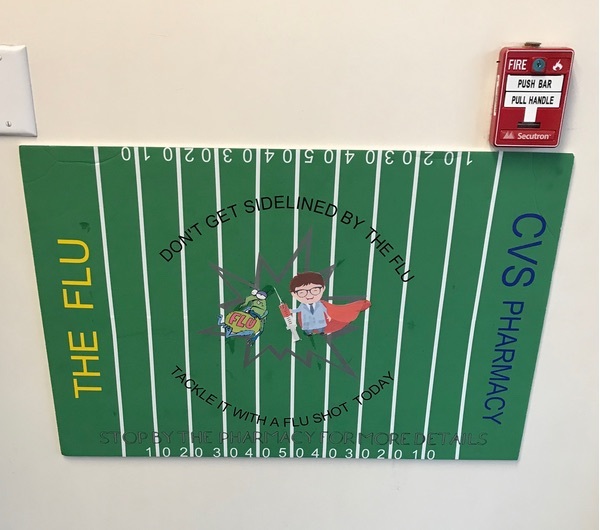 Given the end zone markings, we can surmise that “The Flu” is squaring off in some sort of football bowl game against “CVS Pharmacy”. Zooming in on the center of that image enables us to see some rather crooked play. In the words of The Tick, that’s dirty pool! 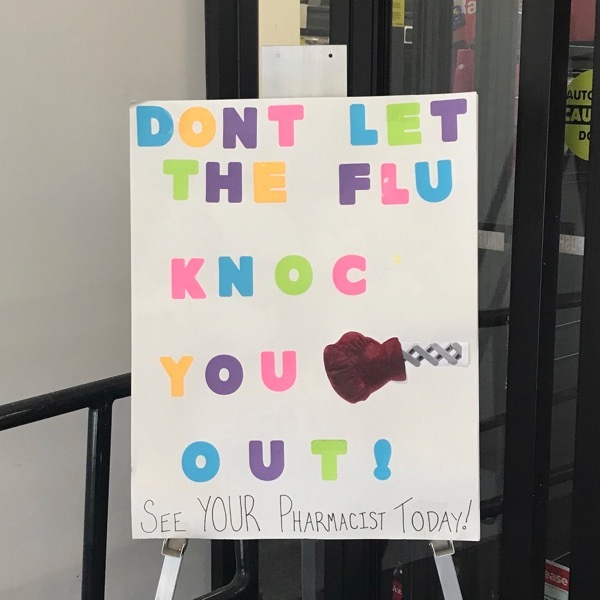 That pharmacist appears to have used a massive needle to take down his opponent. That’s surely a flag for unsportsmanlike conduct, if not grounds for outright ejection. 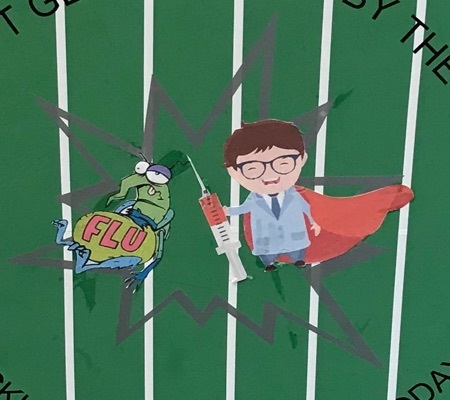 The pharmacist also appears to be wearing a cape, which is an extremely inadvisable choice of uniform for football. 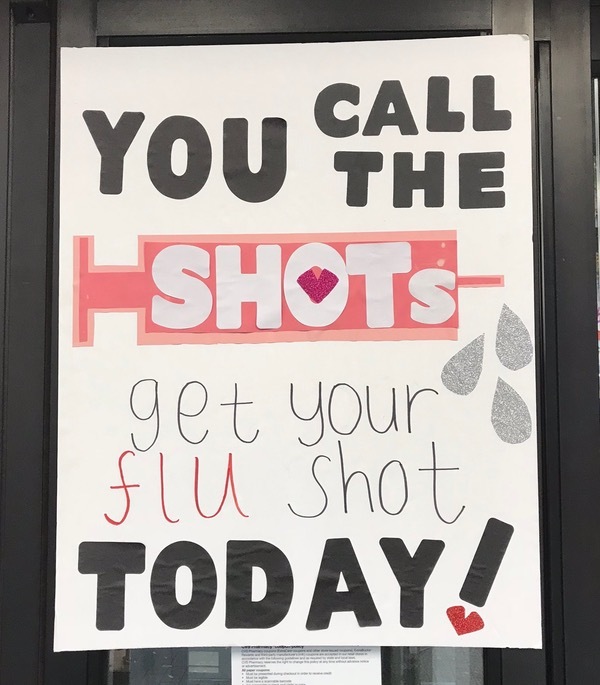 Once I saw this third sign, I was certain I’d find more at other stores. 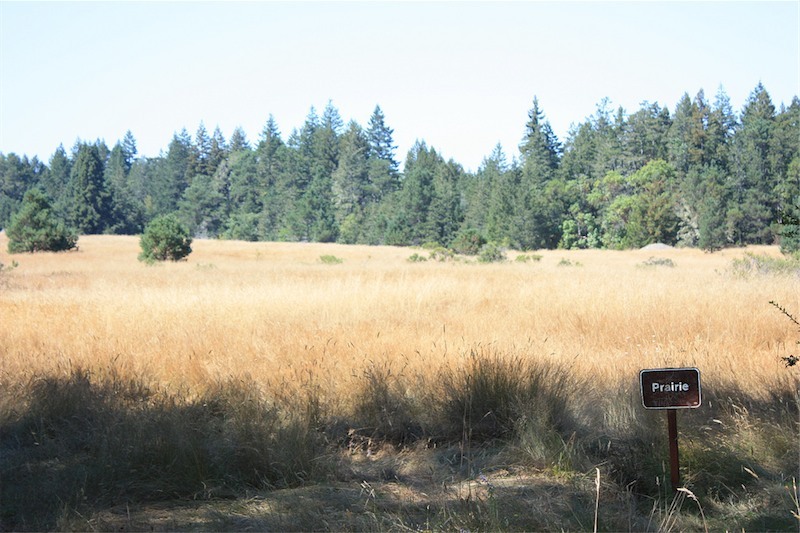 That very day, I visited several additional locations to document more of these signs. I don’t have a lot going on in my life. 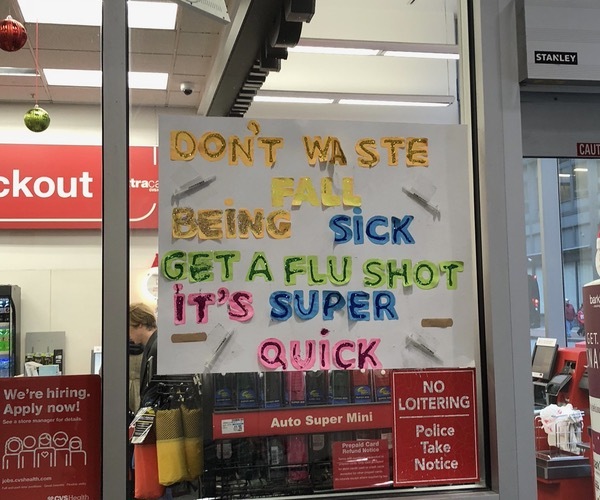 This sign loses a few points for being hung way at the back of the store, but gets them back because it was in the pharmacy waiting area, where people are sure to have time to notice it. 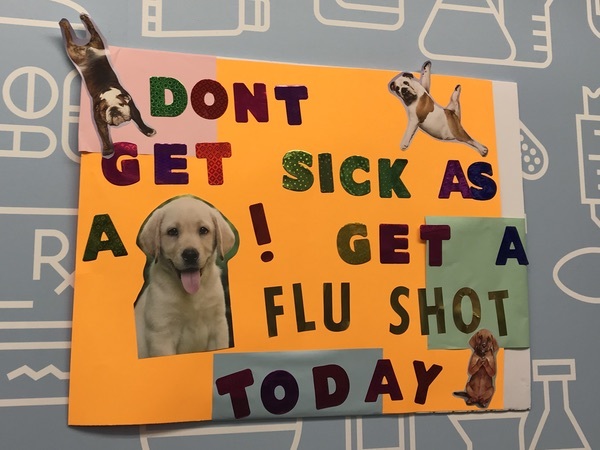 It also earns bonus points for the use of a cute dog. 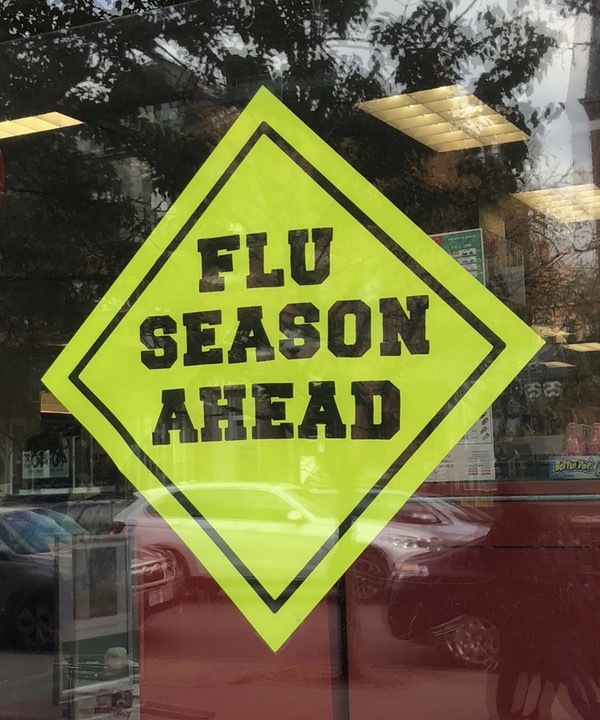 Speaking of cute, this little flu guy is adorable, and helpfully labeled to boot. I’m not entirely convinced I shouldn’t let him catch me. 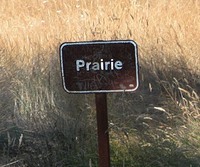 This sign’s lack of any real art made it a little bland beyond its bright colors. However, the inclusion of the coupon in the bottom right is intriguing. 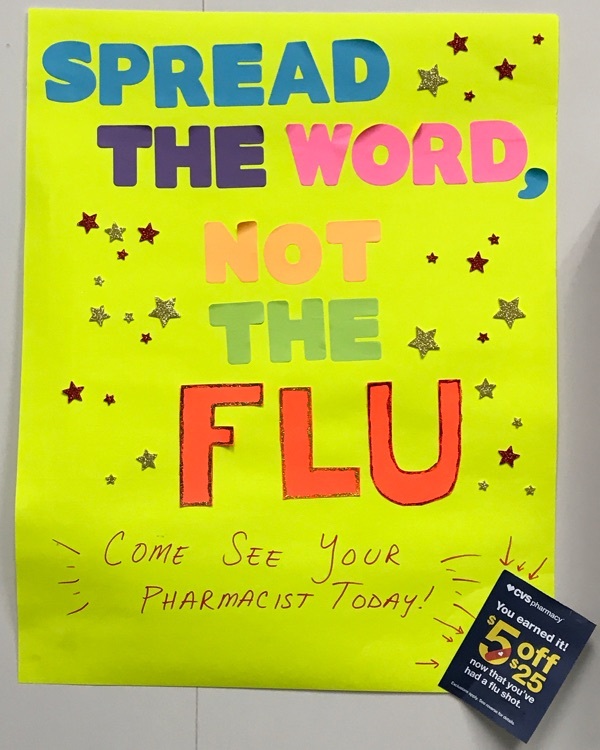 Are there people out there who wouldn’t normally bother to get a flu shot, but will change their minds if offered a $5 off coupon for their CVS purchase of $25 or more? Probably! CVS Store #260 was easily the smallest I visited, and they had a correspondingly tiny sign. Rather than a large sheet of poster board, this is a single 8.5″x11″ sheet of paper. 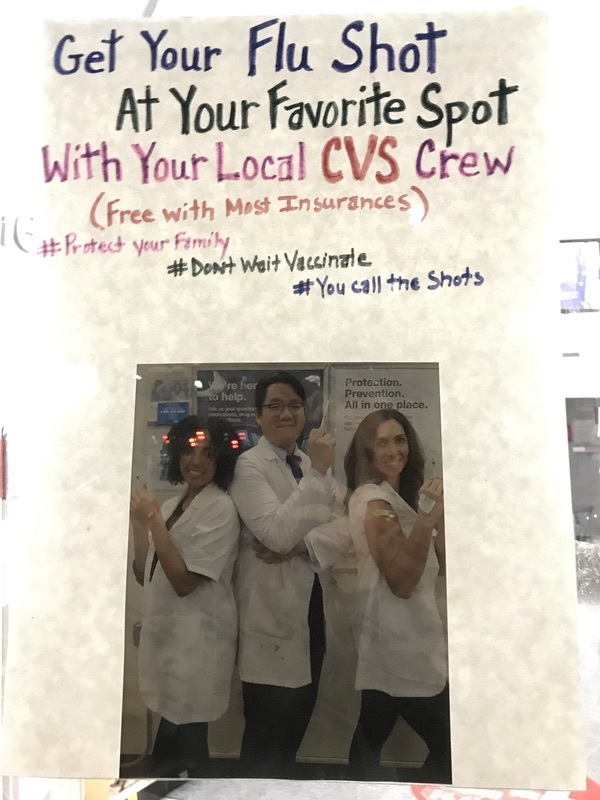 Despite its cramped quarters, the store does offer a photo printing center which these smiling pharmacists no doubt used. This is a decent quick and dirty effort, but there’s a lot of text, and those hashtags are absolute trash. I don’t know how I missed it the first time through. 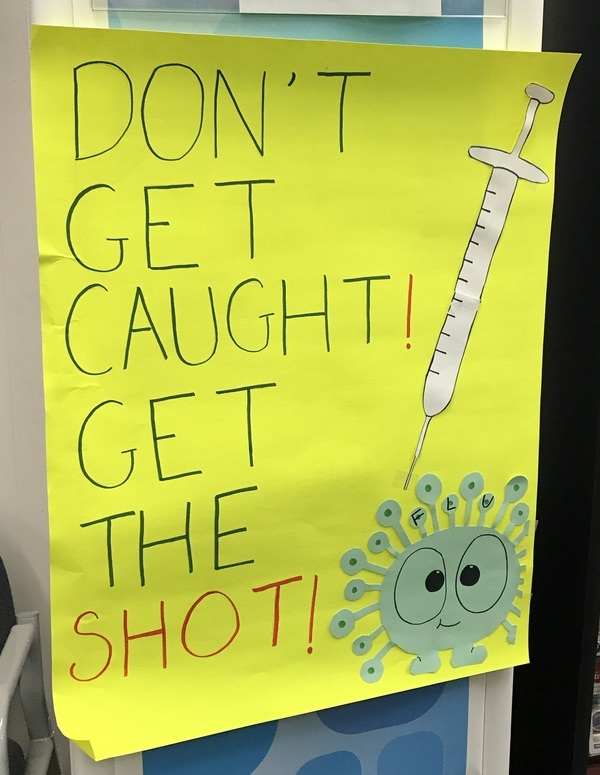 It’s possible they’d spent extra hours (or even days) working on the details of that needle, and hadn’t yet posted it when I came by on my earlier visit. 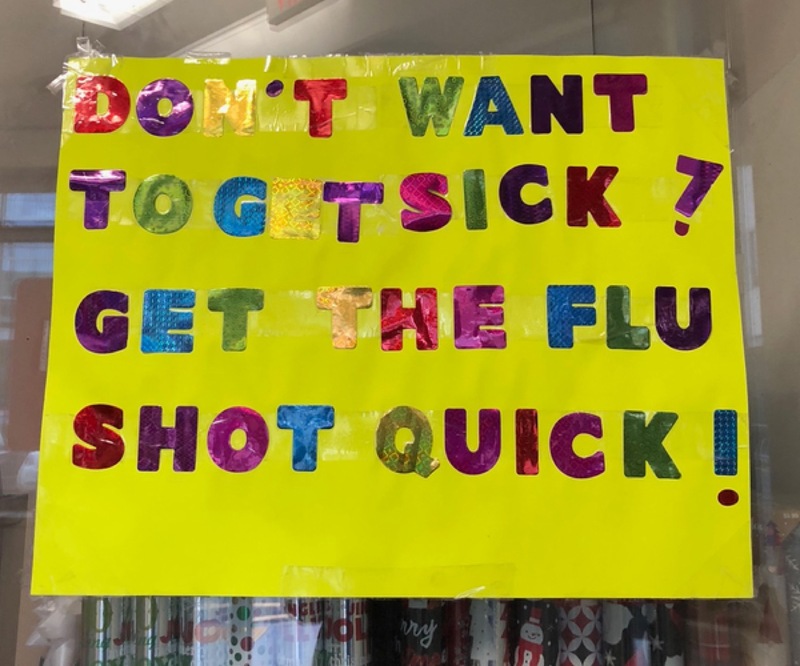 Either way, it was now obvious that every nearby store had a sign touting flu shots, and that no two of them were alike. After tracking down these eight signs, I’ve come to two conclusions. 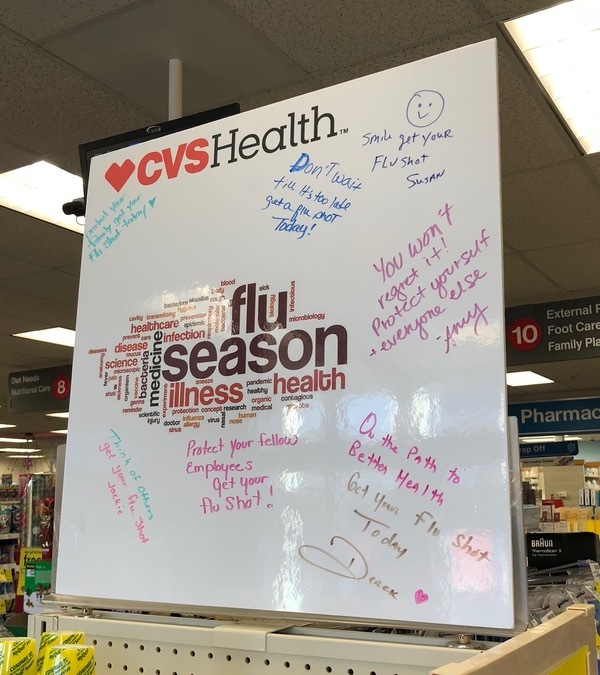 First, it seems certain that CVS issued a directive that their stores advertise the availability of flu shots, but chose not to provide any official signage to display. 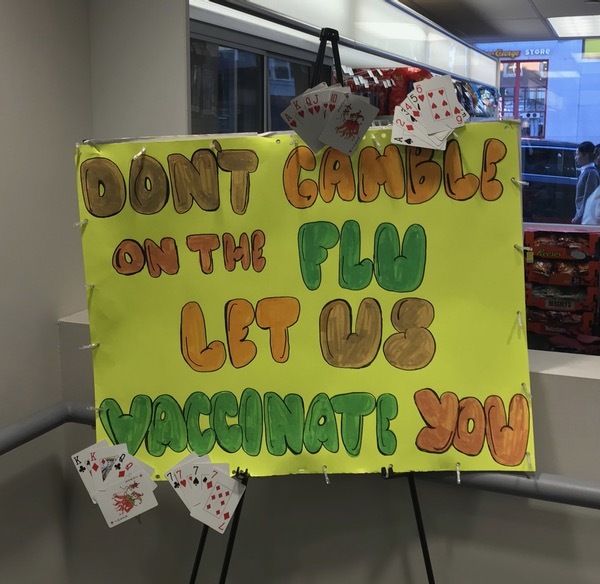 Did this memo suggest making the signs with materials on hand? Was there a budget which would be reimbursed? 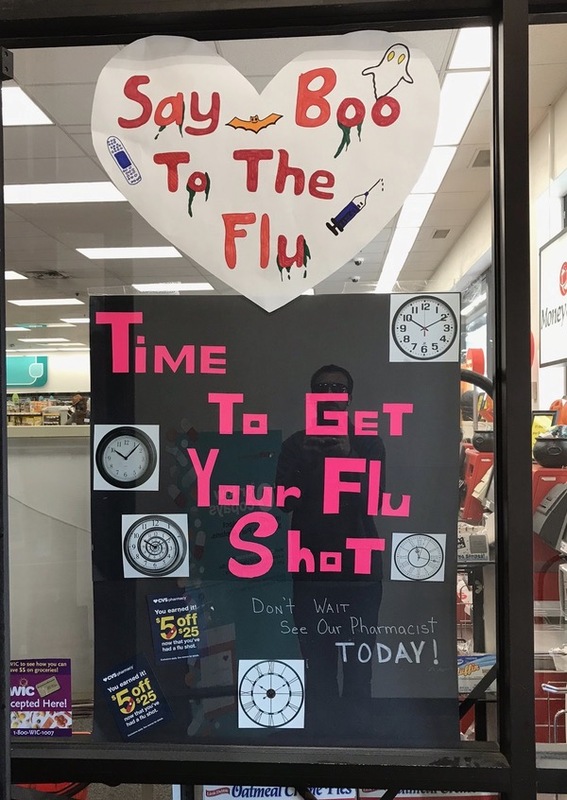 Or even a time challenge? 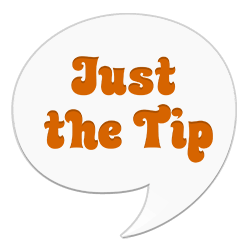 If we’re lucky, some reader out there will clue us all in to the exact details. My second conclusion is a bit more prosaic, but still worth noting: There are an absolute assload of CVS stores around Boston. The store numbering system hints at how common CVS locations must be, but many of them blended into the background until I sought them out. Now, it’s clear to me that you can barely go a block without passing a CVS. Each and every one of them is full of people eager to stab you in the arm with a needle. Most of them are even health care professionals who are paid to be there. Update (December 29th, 2018): If you made it this far, you probably want to see the follow-up post, featuring even more handmade posters. For many years, Harvard Square had two CVS stores within about a hundred yards of one another. There was the good two-story location at 1426 Massachusetts Avenue, and the drastically inferior single-story location at 29 JFK Street. The JFK store had a cramped interior with dingy carpeting, and was best avoided if possible. Of course, it was entirely possible to avoid it, because there was another CVS just up the street. I just said that! Yet two years ago, CVS announced plans for another location, at 6 JFK Street. For a brief few weeks in 2015, there were three CVS stores open within spitting distance of one another. The dumpy 29 JFK store closed soon after the 6 JFK location opened, and more recently, the 1426 Mass Ave store closed as well. 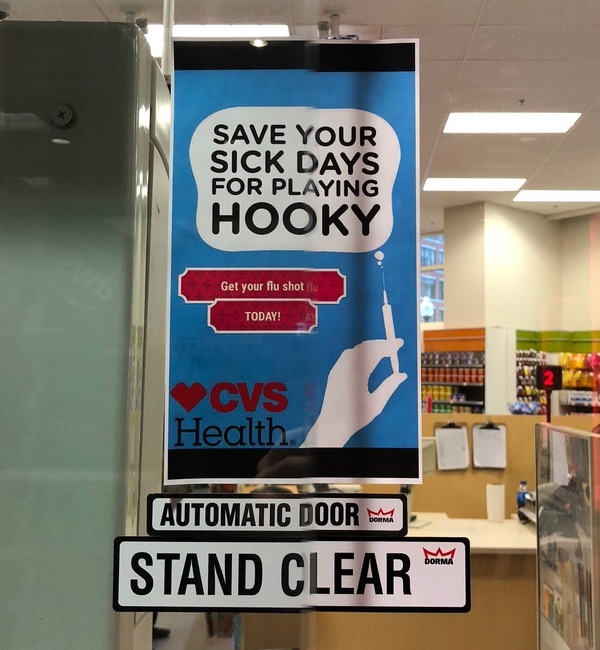 Harvard Square is now down to a much more reasonable number of CVS stores. For instance, they honored America’s first president by naming a street after him. However, they don’t know how to spell his name. At all. You might think this was a warning to watch for children near the street. 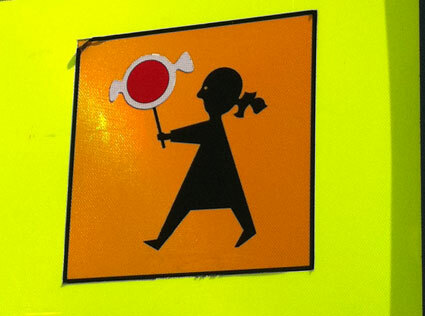 It turns out it’s actually an alert for diabetics, tipping them off to the presence of small girls with ludicrously oversized lollipops. I managed to repeatedly read this incorrectly as “Pies!”. 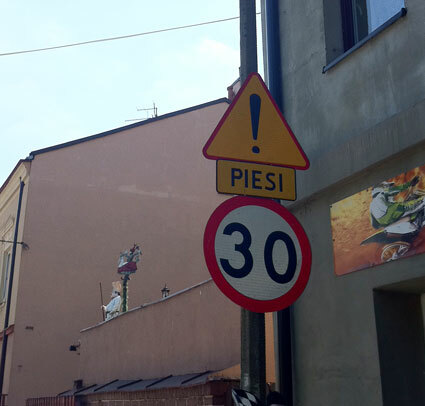 Apparently, this is a pedestrian warning sign, with Piesi being Polish for “Pedestrians”. That’s far less exciting than the thought of delicious rhubarb pie, and really, not at all deserving of an exclamation point. 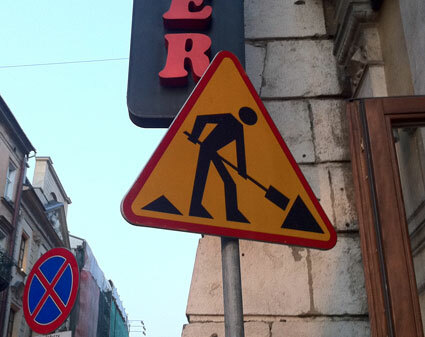 Caution: Man moving triangles! Possibly with a pizza peel! 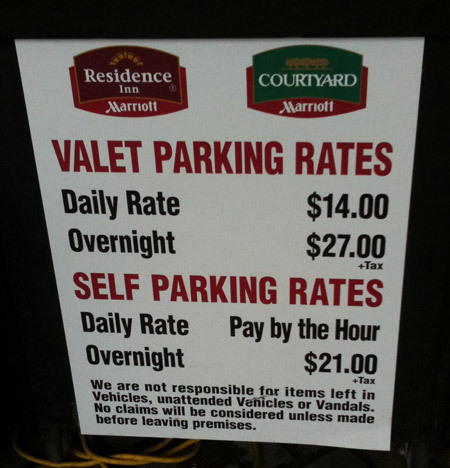 Ultimately, though amusing, these signs aren’t actually unintelligent. The real lack of intelligence rests with the non-native who couldn’t speak the language. Sometimes, the most rewarding searches are those which cause us to look inward and discover something about ourselves. That, or those which lead to the discovery of buried treasure or something. Those are pretty rewarding too. There are many signs in the world. 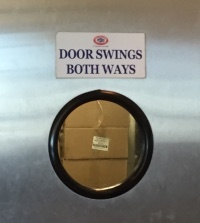 At their best, signs are easy to comprehend, helpful, and informative. Often times, however, they are not. These hilariously flawed signs are the ones I seem to find most often, in my never-ending quest for signs of intelligent life. Be sure to click to see the full-size images. 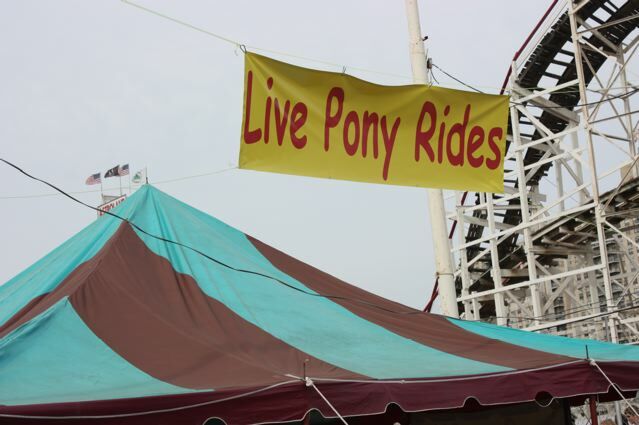 In hindsight, I’m sure it seems obvious that this would be far more popular than the original dead pony ride concept. But business is all about experimenting to find what works. I’ll be the first to admit, this is not always the most mature quest. But if you didn’t giggle at that a bit, you’ve got no soul. 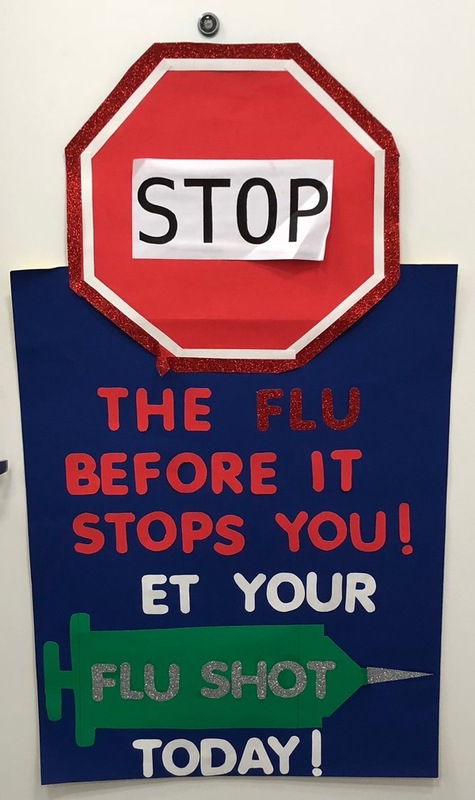 Have you spotted a great sign yourself? Send a photo my way.